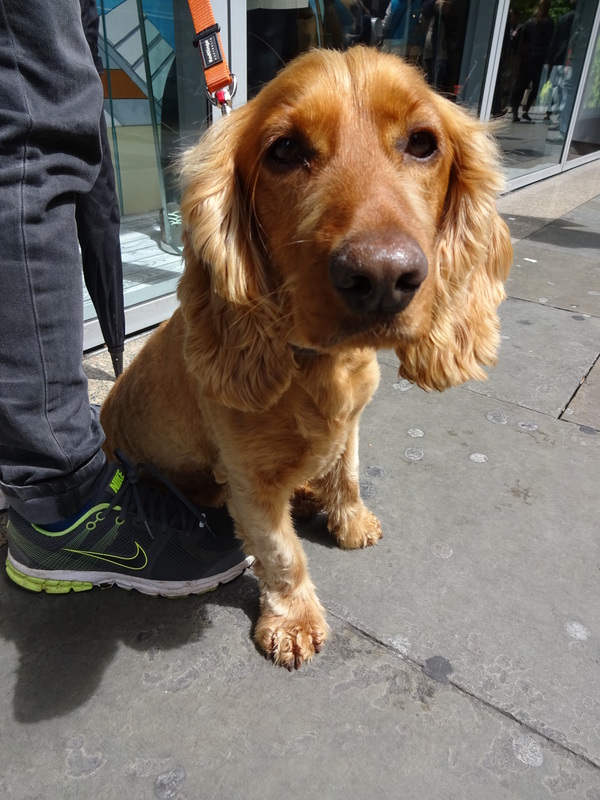 I went out for lunch today with my friend and spotted a dog on our way out of M&S. I went over to say hello to the chap with the dog and we both realised that we had met each other before! He works for the company that has ‘bring your dog to work day’ every Friday! Meg from day 65 wasn’t with him today, instead he was taking Romeo a very handsome Cocker Spaniel for a walk. Romeo belongs to the CEO of the company but he often stays with his human friend when his human dad is away! Romeo is a very friendly boy, very cute! I’m told that there were 5 dogs in the office that day, so amazing! I’m not sure I’d get much work done if there were dogs in work though, I’d be far too distracted! Over the year I might manage to take a picture of all the office dogs! Favourite food: Romeo loves bacon but he loves ham just a little bit more! Favourite pastime: Playing catch! He also enjoys going to work in the office!